In case you haven’t had the chance to see this yet — my latest! and if you haven’t had the chance to subscribe to my blog yet — please do. We were friends from very different cultures, but the trailblazing classic spoke to us both. The announcement that the organization behind Our Bodies, Ourselves will shift its focus to advocacy as of October 1 and no longer update the book made me feel defeated. But the news also stirred up memories. We became friends in 1982, studying to be teachers of Hebrew literature at Tel Aviv’s Kibbutzim Seminary. To our Israeli schoolmates, we were “the American Jewish immigrant” and “the Arab,” bound by our odd accents. After school, we always took the bus to my apartment, even though I preferred not to. “Come on, it’s a two-minute walk,” I pleaded. “If anyone from my village sees me walking without a male relative, I’ll be killed,” my friend said. “Or worse, I’ll be scorned: ‘Can you believe I saw the daughter of Khaled walking in Tel Aviv like a whore!’” Her father was the wealthiest man in their village, and tedious, cologne-soaked suitors lined up to request my friend’s hand in marriage. She simply yawned. The first time she visited me, I offered her pasta. “That’s gross,” she said. “Jews eat such disgusting food.” In a country where Jews stereotyped Arabs, hearing her generalization was refreshing. Learning I planned to visit my friend at her home, my Jewish friends reacted with disbelief and caution. But the only dangers I encountered were the narrow, winding roads and the secondhand smoke. And although my Arabic was rudimentary, I understood my friend’s father perfectly when he yelled in his booming voice — the cadence was the same as my father’s when he launched into a tirade. At night, nodding off to sleep, she poked me awake, wanting to keep talking. She had eight brothers and had never had a sister to confide in. Discovering that Our Bodies, Ourselves was available in Hebrew was a transcendent moment, an antidote to the catcalls we endured on the streets of Tel Aviv. I took the green hardcover off the shelf of Steimatzky’s bookstore and savored the missive from Boston. 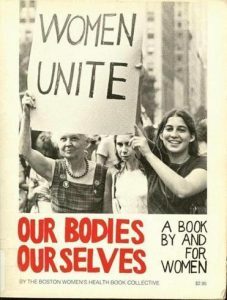 My hometown was also home to the Boston Women’s Health Book Collective, which published that iconic white paperback with the photograph on the cover of three generations of women holding a placard commanding Women Unite. Back then, my girlfriends and I would sit by the Copley Square fountain poring over the pages: “Oh, that’s how that’s supposed to work!” We’d show one another illustrations, relieved that we could get answers without having to ask the questions. To better understand my friend’s situation, I had read Nawal el Saadawi’s book The Hidden Face of Eve: Women in the Arab World, learning about stifled sexuality and traditional notions of feminine honor. Now I was in a quandary. How could I lay down the law for this suitor who would be my friend’s equal partner? We met at his university. “I understand that you’re a communist,” I said. “Why, no,” he said, taken aback. The night before the wedding, she showed me her trousseau in the trunk that had been her mother’s. We sifted through the clothes, the linens, the fine china. And there, hidden at the bottom, underneath the blushing lingerie, was the green hardcover of the good book, the best book. The house was quiet. We were the only ones still awake, two women flipping the pages, women united. Lisa Fliegel is an American-Israeli writer and trauma specialist based in Boston. Send comments to connections@globe.com.